Built for 15 years of continuous duty, this industrial rated motorized impeller provides quiet, efficient, high-volume air movement. The space-saving motor design is completely integrated, and is dynamically balanced with the impeller assembly. Double ball bearings ensure energy-efficient, maintenance-free operation. The Five Micron Fresh Air Prefilter removes all particles from the air that are larger than five microns, extending the life of the HEPA filter and protecting the gas-absorbing media from dust coating and fouling. This prefilter media has a high dust retention capacity due to the crinkly fibers, which offer maximum surface area. The media is treated with a fire retardant additive for safety purposes. It has a high reliability in all operating conditions, including those of extremely high humidity. 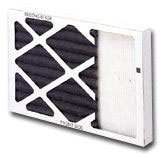 Three separate layers of proprietary gas absorption media are unique to each Sun-Pure filter pack. This special gas media is designed to remove toxic chemicals like formaldehyde, paint solvents, aerosol sprays, cleaning chemicals, pesticides, chlorine, and ozone that may be found within the home environment. This extremely large, 24 sq. 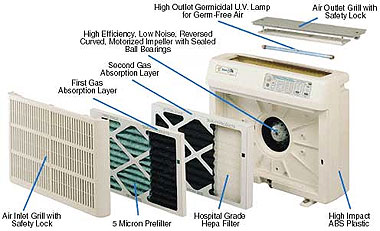 ft. HEPA Filter removes allergens so small that you can only see them through a microscope. Pollen, mold, fungal spores, dust mites, cockroach dust, animal dander, tobacco smoke, and bacteria are but a few examples. Extensive industry studies have shown that as many as 99% of all particles in re-circulated indoor air are less than one micron in size. Many of these sub-micron particles are termed 'within the desirable fraction,' and are potentially dangerous to humans. The Sun-Pure HEPA Filter removes the potentially ha5964rmful contaminants that threaten overall indoor air quality. It only costs 20 cents per day to operate this system full-time, 24 hours per day. This is a fraction of the cost of taking medication which only masks the problem. Designed for hospital operating rooms, the Sun-Pure HEPA filter removes up to 97% of microscopic particles and airborne allergens as small as .3 microns. 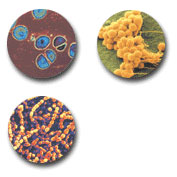 The average human hair is 80 microns in size, and a bacterium is one micron in size. HEPA filters, developed by the military, are capable of filtering out bacteria, fungal spores, dust mites, pollen, insect dust, animal dander, and tobacco smoke. These microscopic particles are known to be one of the primary causes of asthma, emphysema, hay fever, chronic bronchitis, and allergies. The elderly and children are especially vulnerable. > Ultraviolet light deactivates airborne germs, bacteria, and viruses. 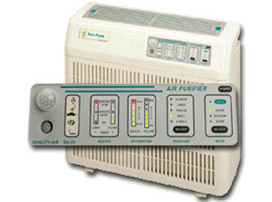 A unique feature to the Sun-Pure air purifier is the use of Ultraviolet Light to destroy microorganisms in the air. Located inside the unit is an ultraviolet lamp producing 100 times the intensity of normal sunlight. Ultraviolet Light attacks viruses and bacteria by destroying the RNA and DNA complex. Once this complex is destroyed, the disease-causing organisms can no longer reproduce themselves. Ultraviolet technology is very important in preventing the spread of airborne diseases from one person to another or by central heating and air-conditioning systems. Microprocessor-based computerized controls provide the ultimate in user friendliness and precision control. The Sun-Pure air purifier makes it easy to set the system to exactly the right air volume by selecting one of 28 different combinations available (four modes of operation, and seven room sizes). This guarantees energy efficiency through proper room sizing. Toxic Chemical & Particulate Sensor. Advanced technology allows the Sun-Pure air purifier to provide this outstanding feature. The solid-state sensor detects toxic chemical fumes, high particulate counts, and dangerous in-home natural gas leaks. The air quality is continually monitored in real time, and brightly displayed using green, yellow, and red light-emitting diodes. One look at the Sun-Pure control center will inform the user of their actual air quality. The Sun-Pure Air Purifier comes with an infrared motions sensor which detects movement around the room and adjusts the unit accordingly. Because more dust and allergens are created when people are in a room, the unit slows down when there is no one in the room, thereby saving you money on energy. Service indicator lights eliminate all guess work by remembering when to replace filters and ultraviolet lamp by keeping track of time and usage. This microprocessor-based feature is not affected by power interruptions, or when the unit is stored for extended periods of time. Electronic sensors monitor air quality and automatically increase air purifier performance to compensate for periods of unusually high chemical activity, or during periods of high particle counts. Warning lights alert homeowners to the presence of toxic chemicals and fumes well before they reach dangerous levels or become detectable to the human senses. A treated five-micron pre-filter removes all particles from the air larger than five microns, extending the life of the HEPA filter and protecting the gas-absorbing media from dust coating and fouling. A specially formulated gas absorption media removes exhaust fumes, organic hydrocarbons, pesticides, and formaldehyde from particleboard used in home construction, paint solvents, chlorine, cleaning chemicals, and other toxic fumes. Activated coconut carbon pleated for maximum surface area removes unpleasant odors from the air caused by cooking, heating and air-conditioning systems, pets, and nearby industrial processing plants. Activated carbon also rids the air of irritating low-level ozone. 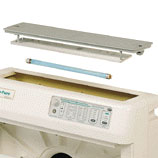 HEPA filters remove allergens so small that they can only be seen under a microscope. 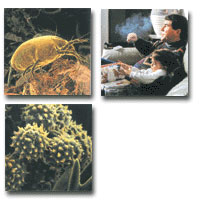 Pollen, mold, fungal spores, dust mites, cockroach dust, tobacco smoke, and bacteria are but a few examples. Ultraviolet light is 10,000 times the intensity of sunlight and kills viruses and bacteria on contact. Ultraviolet technology is an important feature in air purification since germs are easily spread from one person to another by central heating and air-conditioning systems.